Iakhni is a specialty of the Ajara region—people from other parts of Georgia may not have heard of it. Its deep orange color comes from dried marigold, which was historically passed off as the much more expensive saffron and has since become one of the defining features of Georgian cuisine. A dish of the same name appears in various forms across South Asia and the Middle East. It’s likely this dish was brought to Georgia by the Ottomans. In Ajara this dish is typically made with fatty brisket that is boiled until tender, but short ribs are easier to find in the US and come out beautifully when braised (cooked long and gently in nearly enough liquid to cover them). In a heavy-bottomed pan with a lid, sear short ribs in oil until well-browned on two sides. Add onions, salt, pepper, and other spices. Mix well and cook another 5 minutes until onions are tender. Remove the meat from the bones completely before serving with a ladleful of sauce alongside khachapuri, bread, or corn cakes. Grape vines criss-cross Georgia like telephone wires. Cooks in other parts of the country often stuff them with a mixture of beef and pork, but an all-beef filling is more popular in the Ajara region bordering Turkey, where Ottoman influences run deep and many people consider themselves Muslims. Drop the grape leaves into boiling water for 1 minute to soften them. Shock them under cold water and drain them well. Mix the filling ingredients together. It’s helpful to cook a spoonful of it so you can taste it and adjust the seasoning as necessary before stuffing the leaves with it. Line the bottom of a pan with grape leaves to keep the rolls you’re about to cook from sticking. Stuff the rest of the grape leaves: lay a leaf on a flat surface, dull side up. Drop a teaspoon or so of the filling near the stem end, fold the sides of the leaf in to cover it, then roll up and press the tip into the roll as if you were sealing an envelope. Layer the stuffed grape leaves in the pan, seam side down, in concentric circles. Weigh them down with a plate. Pour in enough salted water to cover the stuffed grape leaves up to the level of the plate. Bring the liquid to a boil, reduce the heat, cover, and simmer for 30-40 minutes, until meat is cooked and rice is tender. While the rolls are cooking, puree the yogurt, garlic, and salt together to make a sauce. When the rolls are cooked, remove them from the water carefully using a slotted spoon or spatula. Serve warm with a little sauce drizzled over them. I like to drizzle them with a touch of pomegranate molasses as well, which is not traditional but tastes wonderful. I demonstrated this recipe on Georgian TV earlier today, on Rustavi 2’s “Day Show.” It’s quick, colorful, healthy, and simple to make. (Simple enough to make on live TV without worrying that something will come out wrong!) You can watch the clip below in Georgian and English. Chicken salad is as popular in Georgia as it is in the US, though Georgians don’t typically put it on sandwiches, as I did on the show. 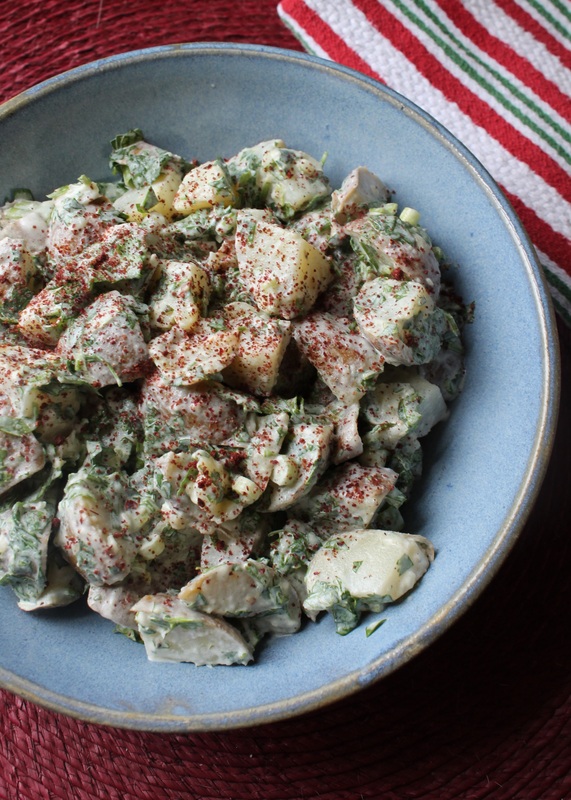 This recipe uses Georgian flavors like pomegranate, cilantro, and walnuts to dress up what might otherwise be a fairly bland dish. I love the clean taste of yogurt here instead of the more traditional mayo, but either will work. You can also play with the herbs: parsley, basil, mint, or tarragon would all fit in well here. Serve the salad as is, stuff it into a baguette, pita pocket, or wrap, or pile it into hollowed-out tomato halves. Put the chicken in a pot with enough water to cover the pieces by one inch. Cover and bring to a boil. Simmer 15 minutes or until cooked through. Remove the chicken to a plate and let cool. Reserve the broth for another use. Shred the chicken into thin pieces. In a large bowl, mix the chicken with all the other ingredients except the lettuce or other greens. Adjust seasonings to taste. If you have time, cover the bowl and chill the salad in the refrigerator for a couple of hours before serving to allow the flavors to meld. 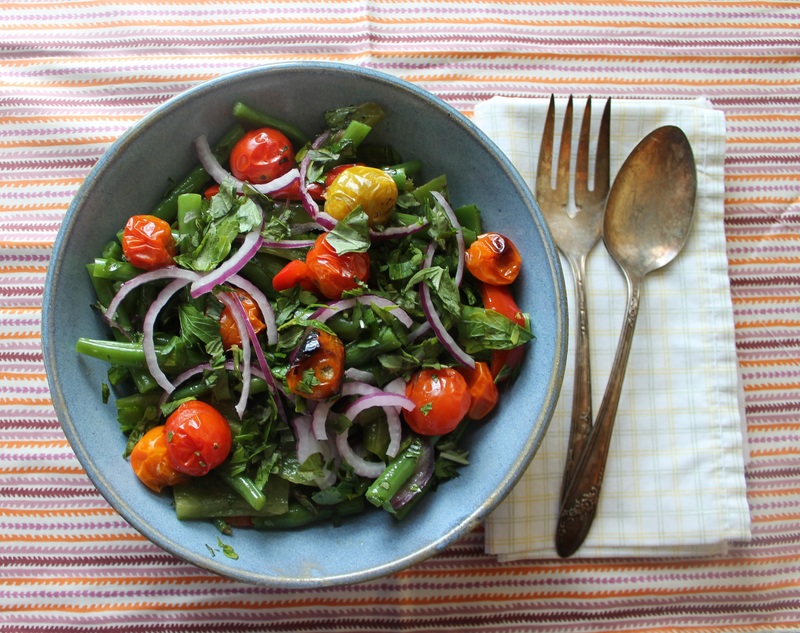 Serve the salad on a bed of lettuce, arugula, or other greens. For a sandwich, layer the chicken salad and greens on a baguette, stuff inside a pita or roll into a wrap. Alternatively, hollow out halves of tomato and stuff the cups with chicken salad. You can find this dip throughout the Caucasus and the rest of the former Soviet Union, where it’s often called “eggplant caviar.” Creative branding, to be sure, since it tastes nothing like fish eggs and costs a fraction of the price. Maybe the eggplant seeds reminded someone of sturgeon roe, or eating it made the plebes feel like kings. I first encountered this dip in Russia, where college students buy it in jars from the grocery store and eat it on slices of dense, tangy black bread with caraway seeds–a sort of Slavic equivalent of a peanut butter sandwich. It even comes in a creamy variety (like this recipe) and a chunky one (more of a salad). Later, I made a variation of it with my friend Inna for her son’s birthday party. Her husband Gena lit up the grill in the backyard, skewered whole eggplants on sharp iron rods, and let them roast over the open flame until they glistened and oozed drippings into the grill box. Inna and her mother-in-law let them cool in a bowl of salted water, then beat the smoky pulp to a smooth paste and added tomatoes, oil, herbs, and spices to make a dipping sauce for the shishkebabs Gena was still grilling out back. This version is my own. You can mix up the herbs you use, add a squeeze of lemon juice or a drizzle oil over the top of the bowl if you like, or throw in a handful of pomegranate seeds if you really want to play up the caviar analogy. Prepare the grill or preheat the oven to 400 degrees F. Prick the eggplant in several places with a fork and place it on the grill grate or on a baking sheet lined with foil or parchment paper. Grill or bake the eggplant until its skin wrinkles and it collapses into itself. In the oven, this takes about 45 minutes. The flesh should be totally soft by this point. Allow to cool, then scrape out the flesh into the bowl of a food processor. * Discard skin and stem. Add the other ingredients into the food processor and pulse until smooth. Adjust seasonings to taste. Serve with bread, pita chips, crackers, or vegetables. *Note: You could also use an immersion blender to puree the dip. The one-two punch of garlic and salt melts into the subtle creaminess of eggplant in these addictive little morsels, which can be found on nearly every Georgian restaurant menu. They make a unique appetizer served simply on crackers or bread alongside a glass of red wine, but are rich enough to stand up to heartier fare like grilled pork ribs and cornbread. The filling can be made up to three days ahead if stored in the refrigerator. 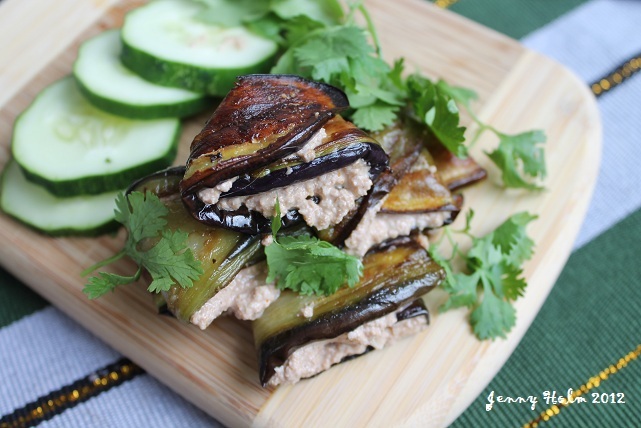 The eggplant slices can be fried the night before combining and serving. 2. Wash and cut the tops off the eggplants. Do not peel. Cut lengthwise into ½ in.-thick slices. 3. Optional but recommended: Salt the eggplant slices generously and let stand for 1 hour, then press out the dark juice, rinse, and pat dry thoroughly with a kitchen towel or paper towels. This is one common technique for minimizing bitterness in eggplant. Using very fresh eggplants will also cut the risk of bitter flavor. 4. Heat 2-3 Tbsp. of oil in a skillet over medium-high heat. Brown eggplant slices on both sides, working in batches so as not to crowd the pan and adding oil as necessary. Wait until both sides have turned golden brown, then remove eggplant slices to a plate lined with paper towels. (They should be floppy, not crisp.) Continue until all slices are fried and set aside to cool. 5. Spread a layer of filling on one side of each eggplant slice and roll up to enclose the filling inside. Arrange the rolls on a platter and sprinkle with fresh herbs, thin-sliced onion, or pomegranate seeds (if desired) to serve. You could also serve the rolls on top of crackers or crostini to make them easier to eat neatly as finger food. If you imagine a Venn diagram with three overlapping circles signifying dip, spread, and salad, pkhali falls somewhere in the middle. That’s a weird category for many Americans—we don’t quite know what to do with it. Trust me, though: you’ll understand when you taste it. The garlicky, slightly salty, vinegary kick of this combo is as addictive as chips, yet you can enjoy it entirely without guilt. Georgians simply eat it with a fork or scoop it up with bread or a slice of khachapuri, but I’ve offered several other serving suggestions below as well. If you have time, make it a couple of hours ahead–it benefits from some time to chill in the fridge to let the flavors meld and the garlic mellow. Bring a large pot of water to a boil. Add the spinach, stirring to submerge the leaves and make room for more. One all the spinach has wilted (about 3 minutes), drain the hot water and run cold water over the spinach. When the spinach is cool, squeeze out as much water as you can. (This is most effectively done by squeezing it, a chunk at a time, between your hands or in your fists.) Put the spinach in the bowl of a food processor or chop it very finely with a large knife and place in a bowl. 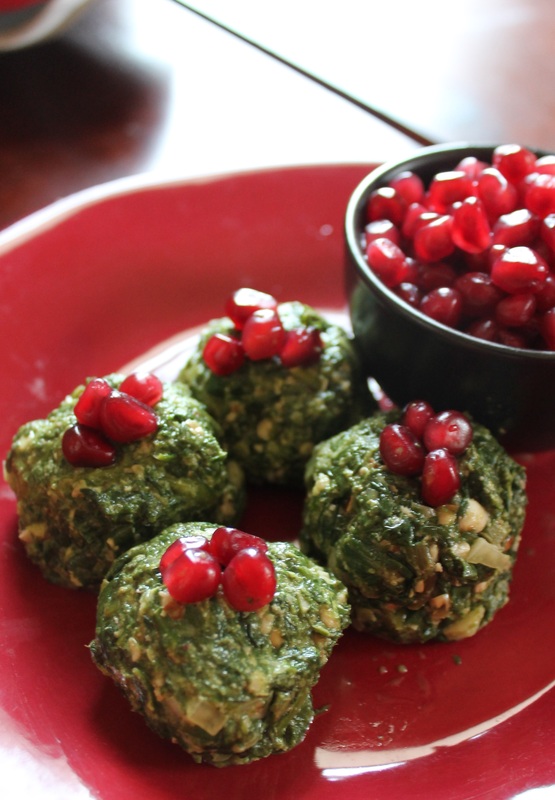 Add the rest of the ingredients except the pomegranate seeds to the spinach and mix well. If you are using a food processor, puree the mixture lightly. (It should still be thick enough to roll into balls.) Adjust seasonings to taste. If possible, chill the pkhali in the fridge for a couple of hours before serving. Serve as a dip with pita chips, crackers, or crispy vegetables. Mix in the pomegranate seeds or leave them on top. 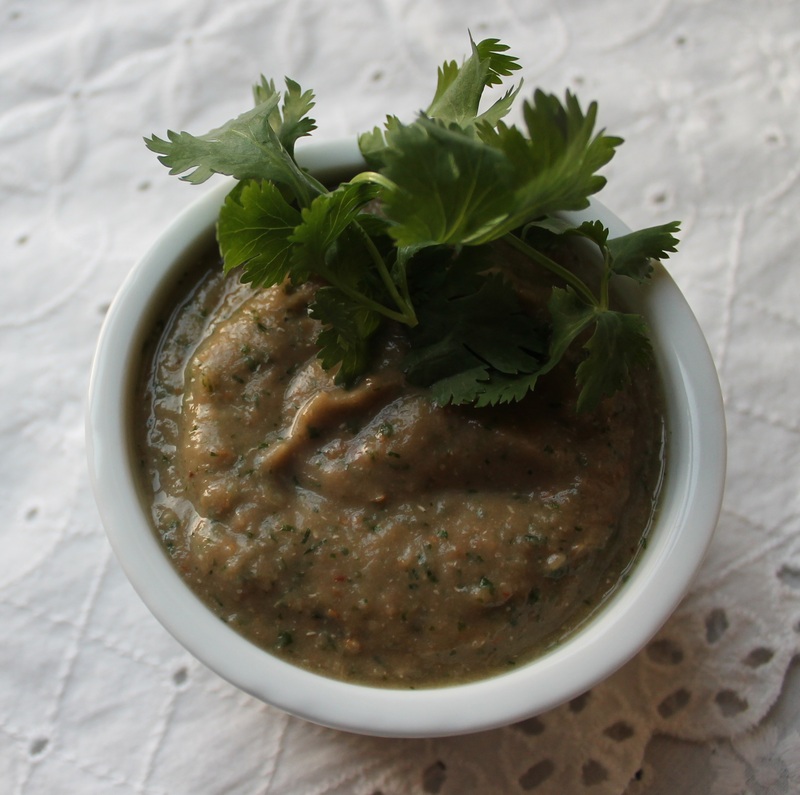 For a creamy dip, mix pkhali with yogurt in equal parts. Form the mixture into small balls (about ¾ inch in diameter), garnish with a few pomegranate seeds on top of each, and serve with khachapuri or mchadi (fried corn cakes). Walnuts candied in honey are traditionally enjoyed on New Year’s Eve and throughout the holiday season in Georgia. (Most Georgians who celebrate Christmas do so on January 7, when it falls according to the Orthodox Church (Julian) calendar.) The crisp brittle keeps well and doesn’t require too much space in stomachs already stretched from days of feasting. 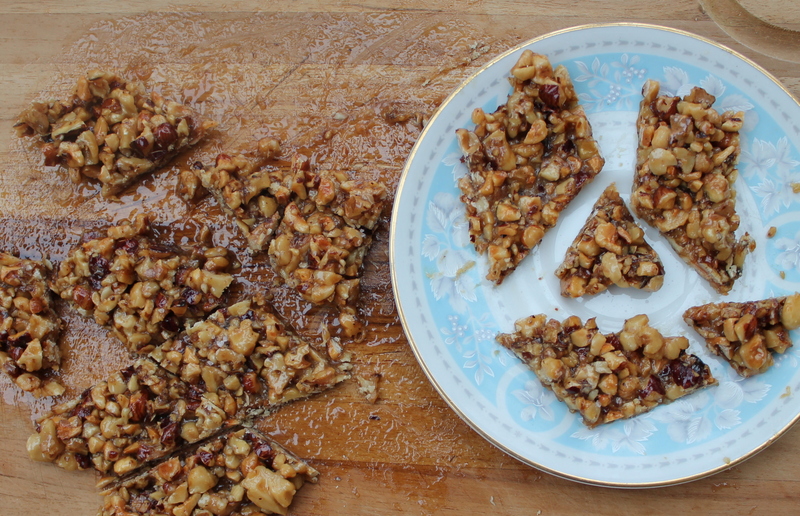 When I make gozinaki, I like to mix the walnuts with hazelnuts, pecans, or almonds and use single-flower honey to lend each batch a distinctive character. As the honey caramelizes, it fills the house with its warm, sweet perfume, somewhere between orange blossoms and gingerbread. By the time I’ve turned the brittle onto my cutting board to cool, everyone is already waiting by the kitchen door, clambering for a piece. Snack on a square of this to get you through the mid-afternoon slump at work, pair it with a shot of espresso for a sweet treat you won’t feel guilty about eating, or bring a bag of it along on your next hiking trip to keep you energized. Add the chopped nuts and ¼ tsp. of sea salt to the boiling honey. Let the mixture come back up to a boil, then reduce the heat to medium and continue to cook, stirring frequently, until the nuts become very sticky and the honey thickens and turns a tawny brown color. Depending on the thickness of your pan and the heat of your stove, this should take about 7-10 minutes. Be careful not to let the nuts burn as they cook, nor the honey smoke. Turn the honey-nut mixture out onto a moistened cutting board. Spread the nuts into a ½ inch thick layer with a rubber spatula or the back of a wooden spoon. Sprinkle the remaining ¼ tsp. of sea salt on top. Allow to cool ten minutes, then chop into pieces of whatever size you desire. (Diamonds are traditional.) Transfer them to a plate or another hard surface, sticky sides up, and allow to cool completely—the brittle will harden as it cools. Store in an airtight container or in the freezer.